Whether you’re a professional photographer, videographer, or a mobile device power user, these high-speed cards provide performance you can trust. They leverage UHS-II technology (UHS Speed Class 3 (U3)) and provide a read transfer speed up to 1000x (150MB/s) when used with the included SD UHS-II reader. * This gives you the speed and capacity you need to capture, transfer, and share more adventures on the go. 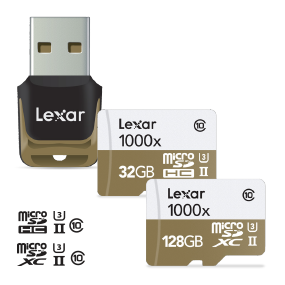 Using the reader that comes with the Lexar Professional 1000x microSDHC/microSDXC UHS-II cards, you’ll experience high-speed file transfer at UHS-II speeds, right out of the box. ** This dramatically accelerates workflow from start to finish, getting you back to capturing the action faster. Professional 1000x microSDHC/microSDXC UHS-II cards include a lifetime copy of Image Rescue software. Image Rescue recovers most photo and select video files, even if they’ve been erased or the card has been corrupted. **** The software is available for free download with purchase of the card.